Hello and welcome back! Today I have a fun post to share with you! Including the above nails and then a fun good nail art video and a super easy nail art design! So lets get busy! First up we have these really sweet Easter nails, at least I think they are sweet. I started these with other intentions and then my "idea" completely failed but it was only on one nail so I wore just the floral coming down from the cuticle for a day and then revamped them to what you are seeing currently. I started with Heroine NYC Peek-a-Blue as my base which has an amazing formula might I add. Then I did the floral coming from the cuticle. I did it all with acrylic paint. I started with the light lavender and then moved on to the pink, which was then followed by the greener, and then darker purple to add some depth, which I also did with a darker pink on top of the pink flowers. After that I started the first phase of the grass which was done with a light green. After the light green I painted on the bunny, the eggs, and the butterfly! Once that was completed I added in some darker green to the grass to give a more realistic look which I think made it. Once all of the art was dry it was then time for some top coat and it was done! I really loved how this came together, what do you think? I would wear these for Easter for sure! Anywhooo if you haven't guessed, this mani is a quick watercolored Easter Egg look. It was slightly inspired by those Paas Kits. We would always get those when we were little and they always came with a crayon that you were supposed to use and it would "protect" those spots on the egg from the color so when you brought it out of the water there would be a design on it. It was always interesting so I kind of based this mani of things I would of drawn. Then with the imperfect watercolor lines it makes it pretty accurate. I just used a white polish, Pretty Beautiful Unlimited White Out, and then some watered down acrylic paint. It was really simple as you will see in the video! Well guys that is it for today! I hope you have enjoyed both manis. Let me know what you thought of the manis and the video, I had so much fun with both the first mani and that video, I mean it was just great! LOL! I adore the wisteria in your top mani! You do gestural nail art in a very recognizable way, and I love it! Thank you! That was my favorite bit, I actually had that part on for a whole day before adding the rest of the art! The watercolory effect is wonderful. Thank you! Both where fun1 The scene one was more fun tho! Weird I know, But it was so fun when it actually turned out. I love your bunny. I want one for this weekend. I love your attention to detail in the first design. It's incredible! You are so talented! I'd like to see this design without the animals too--just the flowers. Thank you! I almost took a photo of it that way! Definitely will have to do it again! 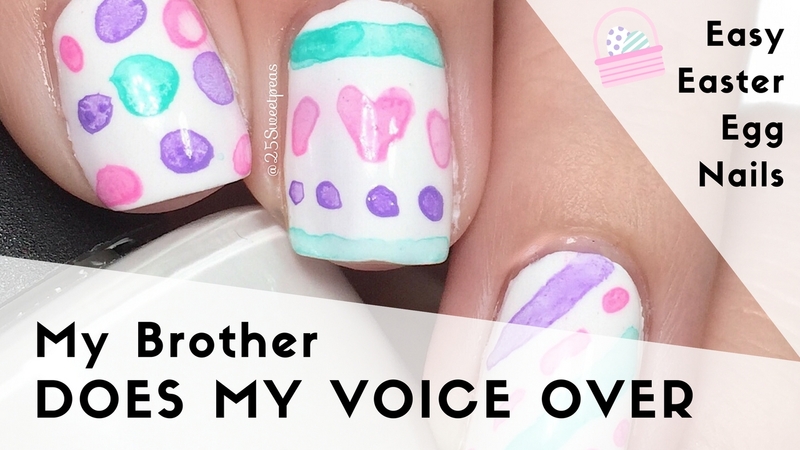 What a cute Easter manicure! I am loving the bunny accent. Very cute mani - love the combination of fun colours! I love the bunny--she's so shy and cute! I love the watercolor look of that second mani! I adore the water colored Easter egg look! Great looks for Easter. I love how much detail you created in the first mani and the water colors in the second look are so soft and springy. I love this scene on your mani! Totally adorable! Awwww! Your bunny is so stinking cute!! I love it!! Takko Lacquer | Neutrals with a Pop!